First things first, it is important that you visually check your filter(s) every month. During peak seasons, when your system runs more often, you may need to change your filter(s) monthly. There are many factors that can affect the life of your filter, i.e. pets, carpeting, open windows and doors, remodeling, even seasonal cleaning can lift more settled particles into your home’s environment. General recommendations are that a 1” inch furnace filter should be changed every 3 months annually. If you have a 4” or 5” inch furnace filter, change every 6 months annually. Air Flow is the most important aspect of your HVAC system operation. The best practice is to remember, “If your filter is dirty…It needs to be changed”. Not only does a filter ensure that contaminants are removed to keep your indoor air cleaner, but also to keep your HVAC components cleaner. Your filter prevents dirt and debris buildup from affecting the performance of your HVAC system. If dirt and debris accumulate inside your furnace or air handler due to a dirty air filter, your unit can be damaged and draw more energy, raising your utility bills and causing the need for HVAC repair. Filters come in many sizes and different materials, so make sure you know what your equipment requires to maintain proper airflow. Never run your HVAC system without a filter, and always make sure the system is off when changing out the filter(s). Good practice is to date the filter(s) when you change them, so you can remember the last time it was done. Secondly, the important part, making sure you are using the right filter size with the correct filter media density and pleating. To find the size of your system’s filter, slide the old filter out of the filter cabinet. Most filters have the dimensions printed on their frame in length x width x height format. If the dimensions are not printed on the filter’s frame, note the model number – by looking up the model number, you will be able to find the filter’s dimensions. Furnace filters range in efficiency, and are rated using a MERV Rating from 1-20. MERV stands for Minimum Efficiency Reporting Value, and provides a general rule of thumb on how effective the filter is for removing certain types of contaminants from indoor air. Beware of the expensive “Allergen” or “Micro” pleated filters with high MERV ratings. We have seen many customers buy these thinking they are doing good by buying the more expensive “better” filters, but end up with an expensive blower motor repair as a result of using a filter that is too dense for their HVAC system’s capacity. Filters of MERV 8 to 11 are recommended for superior filtration in most residential homes. Lower rated MERV filters won’t do as good of a job removing common allergens, dust, and other debris, and will need to be replaced more frequently. Filters with MERV ratings higher than 13 are not designed to work with typical residential HVAC systems. The higher the MERV rating, the higher the chance one may actually block air flow through the system rather than facilitate it, causing damage to your HVAC system. We recommend using nothing higher than a MERV 8 filter to be safe, and avoid restricting the airflow on your system. Another good rule of thumb to go by is avoiding filters with more than one pleat per inch. Every home’s system has additional variables like the age of the equipment, indoor air environment (aerosoles, candles, pets), and how often you actually check/change filter which can effect what MERV rating you may want to choose as well. There are other options like adding a Hepa-filtration system to your HVAC system, which improve the indoor air quality of your home when standard filters just don’t cut it. You can purchase replacement furnace filters through your HVAC service provider when scheduling annual maintenance. If you prefer to DIY, you can purchase them at your local home improvement store, or order them online to make sure you always have a clean spare one on hand. When buying filters make sure to get the right size, and pay attention to MERV ratings. Remember a better filter may not actually be better for your HVAC system. Shown here is a coil being sprayed improperly without the outer hail guards & fan prop removed. 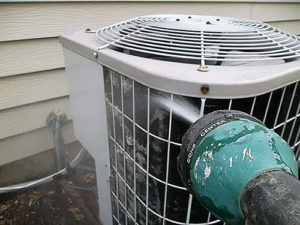 Think You Are Doing Yourself a Favor by Washing Off Your Outdoor Unit Regularly? Washing your coil improperly can cause more harm than good by packing in debris even further. It is always a good idea to educate yourself on your equipment needs before turning the hose on yourself. Cleaning the outdoor unit 1X a year is one of the most important preventative maintenance steps you can take. Make sure if you are calling a professional for annual maintenance & that it is one who will do a thorough maintenance, correctly. Don’t be fooled by purchasing a lower priced “system check” being sold as maintenance that doesn’t include a coil cleaning, or technician that is not doing the job the right way.